1. Put the can of coconut milk into the freezer for about an hour, making sure it is upright. When ready, preheat the oven to 170°C, gas mark 3. Take a 25cm angel food cake tin, and sprinkle the desiccated coconut over the bottom. You do not need to grease the tin. 2. Place the egg whites and cream of tartar into a large bowl, and use a handheld electric whisk to whip into soft peaks. The whites should hold their shape, but not be stiff enough to turn upside down over your head, like when making meringue. 3. Sift the flour and icing sugar together into a small bowl. Carefully fold the dry mixture into the whisked egg whites, a few tablespoons at a time, using a flexible spatula. Keep as much air in the mixture as possible, folding only until the flour has just disappeared. Stir in the lime zest and gently spoon the mixture into the tin. Bake in the centre of the oven for 30-35 minutes, or until the sponge is golden brown and a skewer inserted into its centre comes out clean. 4. Remove from the oven and immediately flip it upside down on to a cooling rack and leave to cool in the tin. When cool, run a palette knife around the inside of the tin to release the cake. 5. To make the coconut icing, remove the can of coconut milk from the freezer (don’t shake it). Remove the lid and spoon the thick white layer of coconut cream into a large bowl. You only want the white layer – stop spooning as soon as you reach the clear, watery part. 6. Add the lime juice and icing sugar to the coconut, and whisk by hand until the mixture thickens to the consistency of whipped cream. 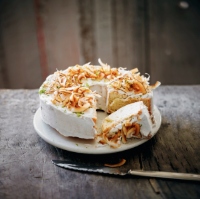 Apply to the top and sides of the cake using a palette knife, then scatter lime zest and toasted flaked coconut over the top. Store in the fridge, until you’re ready to eat it.